Over the years I have received many questions from owners about their Olympic drums. As I am not always around to answer these questions this section of the site might give you the answer you need. If you still need further information please get in touch and I will do my best to help. What is my snare/drum/kit worth? What materials are my drums made from? Modern heads do not fit my drum - what can I do? When was my drum made? Were Olympic shells the same as Premier shells? Can I gig my Olympic kit? It is difficult to put an exact price on second hand goods and it is almost what someone is willing to pay. Ebay completed auctions is a good place to look as you can see what has been selling and the prices achieved. Obviously if the item is in good condition with no modifications it will be worth more. Complete kits and drums with rarer finishes usually command higher prices. Usually wood shell drums were made from Finnish Birch with Beechwood re-inforcing rings. Mostly in a 3 ply configuration however sometimes the middle ply can be of a darker wood. For a period in the early 1970’s Mahogany was used instead of Birch, and kits with mixed woods do exist. Earlier snare drums were usually brass whilst snare drums from the 1970’s were steel. Up until August 1968, 12 and 16 inch tom toms were Pre-International sized, after this date all drums were supplied in standard inch sizes. The 12 inch was undersized by about a quarter of an inch and the 16 inch was oversized by a quarter of an inch. Remo make heads to fit these drums in either Coated Ambassador or Clear Pinstripe. 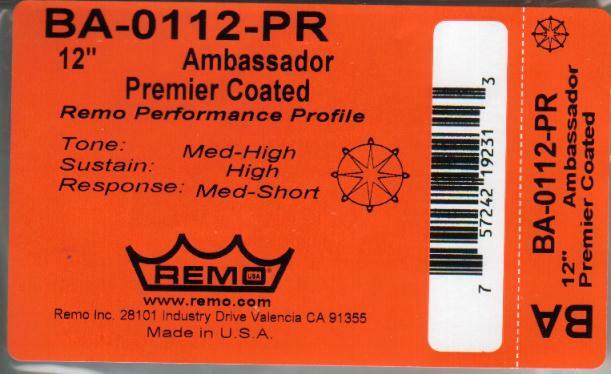 Remo 12 inch Pre-International product number. 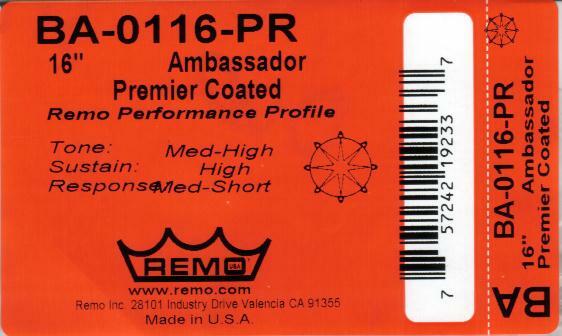 Remo 16 inch Pre-International product number. Some early snare drums are undersized at around 13.5 inches and will need new calf heads to make them playable again. However Baskey Vintage can adapt the drum to take modern heads. Again Ebay can be a good source for bits and pieces whether it be odd drums or tension bolts everything tends to appear if you wait long enough. Some vintage drum dealers can also have what you need. www.baskey-vintage.com, www.pssdrums.com www.swdrums.fsnet.co.uk are worth trying and even posting on The Vintage Section at the www.mikedolbear.com forum can be successful. It can be difficult to accurately date Olympic drums as most models were in production for a good many years. At best depending on the finish, badge etc you can get it down a 3 year span. It is easy to place drums in a particular decade going by the badge fitted, check the badge page for details. Using the finish time chart on the finishes page can also give clues. If you are still not sure contact me with as many details as possible and I will help you out. As far as I can tell yes they were, there are some reports that shells with blemishes were used for the Olympic line but going by some of the drums that are out there the shells are superb and could give some modern drums a lesson. The savings on Olympic drums which were budget drums of the day were made by having less hardware on the shell and pressed steel hoops rather than Premier’s Die-Cast. Yes of course you can, after all these drums were built to be played even although many of them are older than the majority of the people reading this. The stands and holders might be a little light for today’s standards but as long as you are not playing heavy rock your Olympic kit will be quite happy.